Are Large Homes For Sale Breaking The Law? I never would have expected it to happen, but the large homes for sale in Tallahassee are breaking the law. The law of supply and demand. So I'm conducting a reader poll to see what everybody thinks is going on. Law #2 describes the Tallahassee real estate market in general for the past several years until recently. This year, the increase in demand for homes near the median (in both size and value) has increased, moving the market towards equilibrium. But large homes for sale still suffer from a glut of inventory, thus we would expect to see values decline (a lower equilibrium price). While this has been the case for homes greater than 4,000 square feet, the opposite is true for homes between 3,000 and 4,000 square feet. 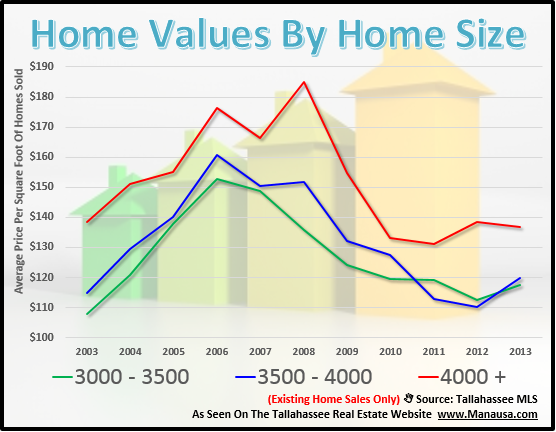 We are wondering why large homes for sale (in Tallahassee, any home over 3000 square feet is much larger than the average home), so why have they seen a rebound in 2013? Could it be interest rates making the homes more affordable? That still doesn't address the fact that supply still far outweighs demand. And with interest rates on the rise, the number of people who can afford these large homes for sale is falling fast. So what do you think is going on? Remember, your thoughts and opinions drive the content at the Tallahassee Real Estate Blog. Please share your thoughts on the inventory of large homes for sale in Tallahassee so we know where to go from here. Large home woes will continue to hang around. In my opinion, when there is a large Mortgage, it does not allow the seller a lot of room to negotiate. I have seen where, in order to sell a home, the seller had to bring money to the table to close the deal. Submitting to the buyer's offer and the mortgage balance demand, indicates the seller's willingness to get out of "Gefängnis" (German for "Jail"), by offering additional seller's cash, if available, to cover the amount of money that's missing to close the loan and allow the seller to move on. Really like the news letter. With the continual pressure on government and the universities to constrain spending (and jobs), economic growth in Tallahassee is at a standstill. The "development" that is going on is merely moving existing customers and jobs from one side of the town to the other. There seems to be little demand for additional luxury homes and little ability for local folks to upscale. The larger home market is really no different than other homes. Only a few good condition and good price with few buyers. The larger homes of yesterday are not what younger buyers today are looking for such as energy efficiency, easier maintenance (inside and out). This is a great post and most offices should be discussing this aspect of their real estate market. Rising interest rates will definitely shift the market again and may stop the oversee buyers we have enjoyed the past couple of years. Large homes are a thing of the past because of the new economics that is coming to America. Some people are aware of this already, and others just have that bad feeling. Kids are moving back with their families do to lack of jobs and money. We are headed for a serious economic problem that has been orchestrated a long time ago. You are in a government market. Look at Washington D.C., it is booming with prices rising. Any time you have a lot of government offices in an area, you will see a more stable market than the rest of the state. That's where the jobs are, if you can get one. And, many times, they make significantly more than the private sector, which is wrong. Here is what I think you are seeing, banks are still not lending to average people in average circumstances. Since these people still cannot get loans, people who can afford more are the buyers able to get financing. These people can look until they find what they want and then strike. People selling these homes can also afford to wait for the right buyer and are not getting into distressed, "sell my home at a fire sale price" position. This price bracket is still de-leveraging and will continue to do so. What your supply and demand statements exclude is time value. I suspect the sellers do not have to sell, banks or original owners. They have time for this latest fiscal expansion to catch up to home prices as more and more people get comfortable with borrowing money again. Original owners have loads of equity or if they have debt, they have refinanced and are comfortable. Banks are banks do not have to get rid of anything. Banks holding on to property is actually a sign of good times ahead. That is my concern as well Bill. We sold 600% more of these homes in 2006 than we did in 2002, creating a vast reserve of large homes that might take a long, long time to find new owners. Thank you Paul ... no rest for the weary! Thank you Jay, it certainly has been tossed around at my office for quite some time. I'll be curious to see how this plays out in Tallahassee Jimmy, I've seen this discussed nationally quite often of late. Good points Mark ... but what happens if lending standards do not loosen until rates return to normal (double today's rate). I think it still results in the same number or fewer buyers for the larger homes. Thanks Jason, but the numbers in Tallahassee do not bear that out. The majority of large home owners used high leverage to obtain their now devalued home. The do not have equity, but they are able to handle their mortgage payments. A large group of these owners are discretionary sellers, waiting for the next group of buyers (who will not have the high leverage loans or the low interest rates) to come to market. In looking at your analysis, my first thought was how many homes (number of sales) are we talking about at each size point and how does this number compare to its historical average? This could be nothing more than "statistical noise" if we are only talking about a handful of sales where one sale at each size point is having a disproportionate effect on the overall average. I wish it were just statistical noise Jeff, but larger homes have rarely been more than noise in Tallahassee :). There is significant data in our study to suggest over-saturation of our market. Ok, if it is not a fluke sale or two causing some noise, then my next thought deals with number of buyers and their ability to buy. For instance, a 3000 sq ft home would cost roughly $354,000 ($118 a sq ft). A 3500 sq ft home would cost $420,000 ($120 a sq ft). A 4000 sq ft home would cost $552,000 ($138 a sq ft). My guess is that there are a whole lot more buyers at the $350,000 level than the $550,000 level. The other potential issue could be that the lower end is closer to market equilibrium than the true luxury end (even if it is relative to the Tallahassee average). Taking this further, your Residential Supply (August 2013) indicates a 10.6 month supply for the $300,000-$500,000 price range (this should cover a lot of the above sales). What happens to the supply if you break this range into $50,000 increments like all preceding levels? Along this same vein, you could also try the market report by plotting price range and size versus months of supply. This could possibly give you a clearer picture of what is going on. You spelled out in better prose my second category. Homeowners without equity who refinanced or can handle the payments while time catches up to their break even point. Now it is just a waiting game for buyers, there are no more forced liquidations etc. (Usually property taxes will start to hurt but valuations where adjusted down and are still manageable). There is excess inventory but that will slowly be burned off as you have a return of move up buyers. Rates are rising nationally due to demand in the $150K-$300K range, freeing up more move up - move up buyers in the $450-$650K range. Now that you have FHA lowering entry again for bad credit / bankruptcy / foreclosure, this volume will continue to swell at the expense of higher end ($1800-$2400 month) rental homes. Lending standards are already loosening. FHA just lowered foreclosure knocks on credit from 3 yr to 1 yr. Banks do not want or need to lend, they are still repairing their balance sheets. The whole ponzi is built on first time buyers, and sellers re-leveraging into higher priced homes. The de-leveraging process and psyche of that is what I think is broken. I sold my 2,200 sqft home north of I-10, and instead of moving up, went to 1,900 sqft in mid town and cut my mortgage in half. Are fellow generation X'ers going to buy higher end larger sqft real estate or enjoy not being tied down to a larger mortgage. Flexibility is what kept me from being a move up buyer and nothing else. It is not that demand decreases but more like prices are getting higher because of other factors thus, decreasing demand. Indeed, the law of supply and demand has been broken because the current situations doesn't apply or relate to the four basic principles of supply and demand.